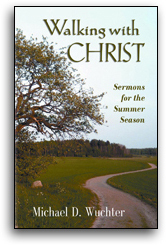 David Rogne's Sermons for Special Days presents a wonderful opportunity for pastors and congregations to connect faith to their everyday lives. His reliance upon history, literature, and scripture will enlighten any student of the word, and each sermon will encourage congregations to embrace a dig-deep approach toward God's truth. 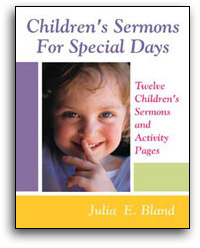 Children's Sermons For Special Days is both relevant and easy to use. The biblically based stories are told in a manner children can understand, and the pictures and activity sheets help to reinforce the learning experience. 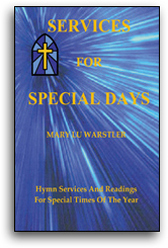 I highly recommend this book as a valuable tool for enhancing worship and learning for children. How does one avoid simplistic, even overly sentimental, preaching and yet address themes that are important to many American churchgoers? 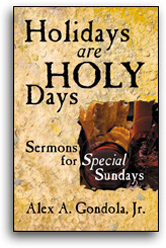 In this book Alex Gondola masterfully navigates his way into insightful sermons on themes which often tax the imagination of excellent preachers. Novice and seasoned preachers will benefit from this book, and all persons who read it will be inspired. In this fourth book of sermons, Michael Wuchter gives us even more creative images to convey and carry the words of the gospel. On Earth Day, he imagines a creation bogged down by government regulations; he balances the dangers of prayer with the risks of a roller coaster ride; and he comes to terms with the true meaning of sin and grace while camping next to some unruly families from Brooklyn. These twelve sermons are chock full of illustrations that bring God's word alive. You can almost smell the bread as he describes a bakery in Manhattan, and you can feel both the raw tension and emerging unity in the diverse communities of the Namibian church. Wuchter gives us himself and his insights in these carefully crafted sermons. They are both a joy and a challenge to read. Michael D. Wuchter was the senior pastor of First Lutheran Church in Duluth, Minnesota, when he suddenly passed away while traveling to Namibia. In addition to parish ministry in Minnesota, as well as at Resurrection Lutheran Church in Hamilton Square, New Jersey, Wuchter also served for 18 years as university pastor at Wittenberg University in Springfield, Ohio. 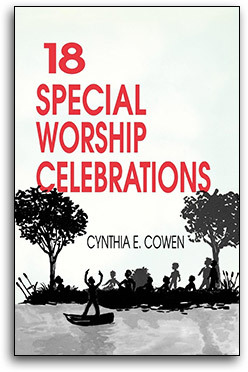 18 Special Worship Celebrations is a collection of worship resources that enhance the life of any congregation. The Saga Of Bobby Wildgoose, a service and sermon specifically for the fall kick-off of Sunday school and commissioning of new Sunday school teachers. Facing The 21st Century With A 16th Century Faith, a message and service for Reformation Sunday that examines what motivated Martin Luther in his disagreements with the established church. Running With The Cloud, a stirring All Saints' Day sermon and service reminding us that we can draw great strength from the lives of the "saints" who have gone before us. A Solid Place To Stand, a Thanksgiving message and service that explores how the Bible's promise of God's presence with us gives us a firm foundation to base our lives on. The Measure Of A Man, A Heart Prepared, Night Watch, and Tidings, a set of four first-person monologue sermons for Advent that tell the old, old story with a twist. A Youth Sunday worship service with a charming children's story honoring the presence and participation of the church's young people. 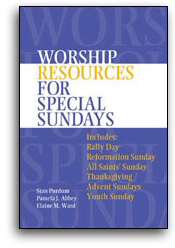 Looking for worship material specifically tailored for holidays and other special, out-of-the-ordinary occasions? If so, then you'll draw on this compendium of services for fresh ideas throughout the year. Easy to use — every service comes with brief instructions and a sample form for your worship bulletin. Versatile — most can be used without a pastor, perfect for pastoral vacations or other occasions when the laity is in charge of worship. Flexible — ideal for both large and small congregations, services can be presented with as few or as many participants as desired. Congregational involvement — Each service actively involves the congregation through the singing of several hymns, as well as scripture and dramatic readings which can be performed either with or without costumes.